Interview with Clarisse Muvuba, director of the Cinéma au Féminin Festival (CINEF, Kinshasa) | Entretien avec Clarisse Muvuba, directrice du festival Cinéma au Féminin (CINEF, Kinshasa) by/par Wendy Bashi. Africiné Magazine, Bruxelles -Images Francophones. 06 July 2018. 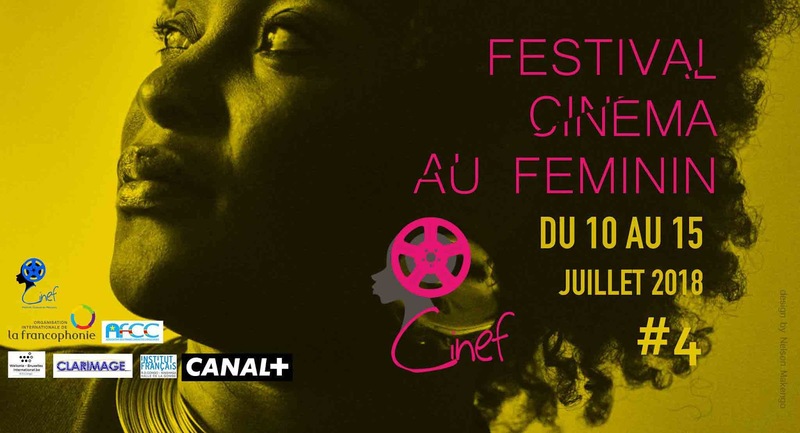 After a pause of a year and a half, the festival Cinéma au Féminin Kinshasa (CINEF) has returned. From 10-15 July, the Congolese capital vibrated to the rhythm of this great cinematic encounter. For its fourth edition, Cinef innovates. A meeting with Clarisse Muvuba, director and founder of the event. 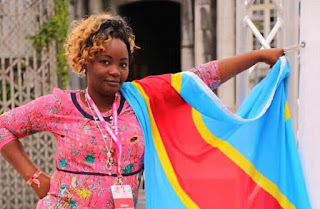 Clarisse Muvuba, next week the fourth edition of Cinef, Cinéma au Féminin that you created in Kinshasa resumes service. What can you tell us about this fourth edition? 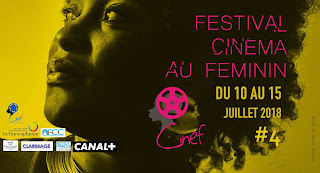 As you said, on 10 July, we will launch the fourth edition of the Cinef [Women’s Film Festival - Cinéf 2018] here in Kinshasa. After a year and a half pause, I am happy to return with a ground-breaking fourth session, which continues in the spirit of the previous editions. This year we have focused on programming. Film production on the continent is booming both in quantity and quality. It is our duty as a festival to highlight all these productions. The Cinef aims to be at the same time a promotional platform for our productions as well as a space for analysis of films and the themes that they highlight. Tell us about your programming. What did you decide to focus on this year? From the beginning, my team and I agreed on one point: to show quality films, films that are thought-provoking, that meet the criteria both technically and narratively, but especially films made by women. It was not a simple task. As you can imagine, it is difficult to meet all these criteria. We had to make compromises, we talked a lot about the quality of the films and in the end I think we are proud of our programming. You know, during the period of the call for submissions, we received a lot of films. I take this opportunity to thank all the filmmakers who sent us their films. At one point, there was a discussion about making a selection. While there are a lot of films produced in Africa many of them are not completed. A festival is also an opportunity to be aware of the shortcomings in our productions and propose solutions to overcome the lack or sometimes to make improvements. What do you propose concretely to Cinef to overcome this deficiency? In all modesty, Cinef does not claim to be able to rectify all the problems and other concerns that the cinema industry encounters in Africa. Far from it! At Cinef, what we offer are workshops, though, because of the lack of means, the time in which to do so is not sufficient! That said, we try to bring a few filmmakers together during the festival and offer technical advice during the workshops that we propose. Through the whole process of making a film, from the beginning to the end, the director needs to exert strong leadership. You will agree with me that it is not in four or five days that we can train everyone and have convincing results. During the workshops, we invite them to come with their productions. The idea is above all to talk about these projects with more experienced directors and producers. It is designed as a moment of exchange and reflection to move projects forward. Together we identify problems, what could have been done and what needs to be done to improve the film. During these few days we offer some possible solutions with the hope that they may be useful, but again considering time limitations and especially insufficient means. We would need more time for training, because believe me this is where the problem lies! You talk about having the means for training, what are the resources available to organize this festival? You touch on a complex question! Culture as a whole suffers from this lack. This experience is critical and flagrant across the continent. I cannot go into the adventures of Cinéf. Though that said, I think it is time for our nations to put in place coherent and effective cultural policies. It is unacceptable and incomprehensible that even today no funds are effectively allocated to culture. In my country, I cannot count the number of initiatives that deserve to be supported but nothing materialises. Culture remains the “poor relative” of all governments. We are left to wonder if, as cultural actors we are the only ones who recognise the expansion of the cultural level, in all sectors, which needs to be supported! From cinema, to music, and the visual arts, the whole sector is just waiting for assistance and funding. Returning to the Cinef, what are the new features of this fourth edition? As I noted at the beginning of the interview, we decided to give the festival a fresh start. This year, we have great films like Frontières | Borders by Apolline Traoré, which received awards at Fespaco; Ouaga Girls by Theresa Traoré Dahlberg; or Maman Colonel by Dieudo Hamadi. These are portraits of strong women! This is the message of this fourth edition: to talk about strong women, those who dare! Apart from that, the biggest new feature is our youth section. Undoubtedly, I am convinced that we must introduce to the younger ones how to read images and to familiarize them with our own productions. Alain Gomis: Petite lumière, Douglas Masamuna [Ntimasiemi]: Mines de rien, which talks about child labour in the mines of Katanga, a very sensitive topic, or Sébastien Maître: Petits meters à Kinshasa. It is important for the younger generations to see the films that are being made locally and whose heroes resemble them. Then, we tried to design workshops thematically that touch on topics such as women's migration, albinism and the stereotypes around it or afro hair. The common denominator of all these workshops is to be able to open the debate on themes that are at the same time, relatable no matter where in the world you are. What do you hope for as Cinef approaches? (Laughs) that everything goes as we envisioned it.